Make your travel easy and plan your bookings accordingly with Yatragenie. This is your bus and cab booking site that will your travel life easy and affordable. This online bus booking portal has more than 200 bus operators that have connectivity to all PAN cities plus other remote village areas. So no need to depend on trains or even change so many trains just to get to one destination. Yatragenie cabs are also pretty suitable if you are traveling to a near-by city or village and their rates are economical as well. Just get on the site and use various promo codes that they provide to their users. Yatragenie cabs are now available in Karnataka state also along with Andhra & Telengana. Book here and get flat 20% discount on cabs without applying any offer code. Cab fare starts from Rs 12/km. Book cabs with HappySale Yatragenie offers and save on your cab bookings online. Book now. Book Hyderabad to Nellore bus tickets online at Yatragenie online bus booking portal. Here the ticket fare range starts from Rs 670 only. Choose from various travels based on amenities provided like AC, Non AC, sleeper, semi sleeper etc available from the landing page. Start booking now. Yatragenie cabs are now offering their services in Kadapa as well. Book cab at flat Rs 100 for first 6 Kms. No coupon code is required to get this best fare. Ride now and get huge discounts. Book Yatragenie cabs in Ongole and get best fare. Here cab range also starts from Rs 10/km. Currently booking cabs in two tier cities made simple with Yatragenie cab services. Book with HappySale cab booking offers and save on your online bookings. Start booking now. Now Yatragenie cab offers its services in Kakinada with a very nominal cab fare. yatragenie cabs are the only premium cab services in Kakinada with low price. Book here through mobile app or web and get best price on Yatragenie cab bookings. Book today. Yatragenie - Hyderabad Offer: Yatragenie is offering bus booking, hotel booking, and cab booking services at best price. Book cabs using Yatragenie and avail marvelous discounts on cab charges. Here the Yatragenie cab charge is as low as Rs 10/km. Get a taxi in Hyderabad for just Rs 100 for first 6 kms with Yatragenie cab service. GPRS tracking, security, panic button, verified drivers also available in Yatragenie cabs in Hyderabad. Book secure cabs with Yatragenie and get amazing user experience. Book today. Yatragenie is offering amazing discounts on Bangalore to Visakhapatnam route bus bookings. Here the bus fare range starts from Rs 1250 without applying any promo code. You can choose from different bus travels like VRL travels, SVR travels, Komitla, SRS travels etc. Book here for your trip and get best savings on your online bus bookings. Make your bus booking online with YatraGenie and avail best discounts. Here YatraGenie offers you best deals on your booking from Bangalore to Nellore. Surf to the landing page and make your booking with the best YatraGenie discount offers. Not required any special YatraGenie vouchers to make avail of this deal. Book and get it now. Book hotels online at Yatragenie and get ease on your pocket. Yatragenie brings an extensive variety of Hotels in Vijayawada. Click here and check for the available list of hotels where its range starts from Rs 595. Now get the hassle free hotel bookings with Yatragenie and benefit the services provided by them. Book hotels now. With Yatragenie, Book Komitla travel buses in various routes available and avail cheapest fare ever. Now komitla travels introduces Volvo I Shift buses for the below routes. Now you can book Volvo I Shift bus tickets in these routes using this offer with Yatragenie. Enjoy this offer and start booking. Yatragenie is offering best price on tour packages. Here you can book for Bangalore-Madurai-Rameshwaram-Kanyakumari-Bangalore tour which is for four days. Trip includes 3 night stay in non Ac deluxe rooms and excludes entrance fees, guide charges. schedule for this tour package is as follows. DAY 1: Evening 9:00 PM departure from Bangalore, overnight journey to Madurai. DAY 2: Arrival at Madurai, hotel checkin, afternoon Madurai sightseeing. DAY 3: Departure to Rameswaram, sightseeing full day, Night halt at Kanyakumari. DAY 4: Full day Kanyakumari sightseeing, Evening departure to Bangalore, arrival at 6:00 AM. Click here to check the fare and book today. No Yatragenie discount codes 2017 are required to get best price on Yatragenie tours. YatraGenie travels has entered into the cab sectors along with bus bookings. In cab sector, Yatragenie is bringing Bangalore cabs at best price. They launched cabs in Bangalore for Rs 150 per 8 kms. Also extra Rs 13 per km. Yatra mini at Rs 100 per 6 kms. Rs 10 per km (extra). Click here to book a cab now at best price. Click here to get all details and get pocket friendly fares on cab services. Book with HappySale Yatragenie discount offers 2017 and save on your ticket booking. Yatragenie cab services are now available in Andhra, Telangana and Karnataka states. Cab fare starts from Rs 100 for first 6 kms and the fare per km also starts from Rs 10/km. Yatragenie cabs are available in 60+ district headquarters like Ananthapur, Atmakur, Bangalore, Belgaum, Bhimavaram, Buchireddypalem, Chamrajanagar, Chickkabalapura, Chikkamagaluru, Chitradurga, Chittoor, Davanagere, Doddabalapura, Eluru, Gudivada, Gudur, Guntur, Hassan, Hindupur, Hyderabad, Kadapa, Kakinada, Karimnagar, Kavali, Khammam, Kolar, Kurnool, Machilipatnam, Madikeri, Mahaboob Nagar, Mancheriala, Mandya, Mangalore, Manipal, Mysore, Nalgonda, Nellore, Nizamabad, Ongole, Rajahmundry, Sanga Reddy, Shimoga, SriKalahasti, Srikakulam, Sullurpet, Tirupati, Tumkur, Udupi, Vijayawada, Vishakapatnam, Vizianagaram, Warangal. If you are from one of these locations and looking forward to book a cab then click here and get best fare on your online cab booking. Start booking now. Are you in a search to book bus tickets from Hyderabad to Guntur? 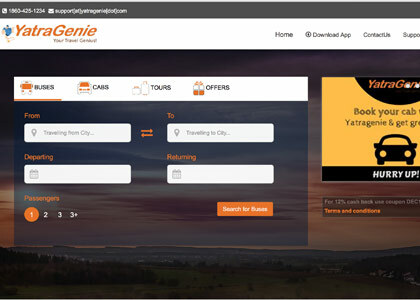 Then booking tickets in this route is done peacefully with Yatragenie. Click here and select the cities i.e, from Hyderabad to Guntur then choose the date of journey. Then you will get all operators available in this route. Pick from the travels and choose based on their amenities. Start booking. With Yatragenie, you can book hotels in travel destinations and avail great discounts. Yatragenie hotel offers best price on Hotel bookings. Hotel booking services available in cities like Nellore, Guntur, Hyderabad, Vijayawada, Ongole, Eluru, Rajahmundry, Vishakhapatnam, Razole, Chilakaluripet, Tirupati, Kakinada etc. Click here to find great deals within your budget. Currently Yatragenie cabs are available in Vijayawada. Book these cabs using Yatragenie website or mobile app and get lowest fares on cab bookings in your city. Here for first 6 kms you need to to pay just Rs 100. No offer code is required to get lowest price. Start booking now. Yatragenie gives best bus booking experience to all of their customers. With Yatragenie, get hassle free online bus bookings from Hyderabad to Ongole. Book here and get best fare on Hyderabad to Ongole route buses. Here the fare starts from Rs 500. Select based on your requirement from different travels available and also based on amenities provided like Ac, Non AC, Sleeper, Semi Sleeper etc. No promo code is required to get this deal. Book cabs in Visakhapatnam with Yatragenie cab services and get best discounts on cab charges. Here the cab fare is Rs 100 for first 6 kms. Get taxis with Yatragenie at just Rs 10 per km. Book here and get ease on your pocket. Book with HappySale offers to save on your online bus bookings. Book today. Now hotel bookings are available with Yatragenie.com along side bus booking and cab booking services. Book hotels in travel destinations and get best savings. Yatragenie hotel bookings are available in Nellore, Guntur, Hyderabad, Ongole, Eluru, Rajahmundry, Chilakaluripet, Tirupati, Razole, Kakinada, Vijayawada, Vishakhapatnam etc. Book budget hotels in major cities of Andhra pradesh (AP), Telangana, and Karnataka. Book with HappySale online offers and save money on your hotel bookings. Book today. Yatragenie offers different tour packages at pocket friendly fares. Schedule for Bangalore-Mysore-Ooty-Coonoor-Bangalore tour is as follows. Enjoy your holidays with this tour package deal and get best offer by clicking here. Book here and save on your tour package online bookings. Tour packages are available with Yatragenie travel site. Here you get Bangalore-Mysore-Ooty-Kodaikanal-Bangalore tour at pocket friendly fare. This trip is for 4 days and 3 nights, that are scheduled as follows. Now make your travel safe and secure with Yatragenie. Click here to find extra information related to this package. Yatragenie travels has been successful in every travel portion that it has presence. To facilitate more and make the transactions even more easier, Yatragenie is now introducing Genie wallet. It makes your payments hassle free, saves your money and time. Add money to this genie wallet and that can be used to book bus tickets, hotels, cabs and for tours also. Now availing cashback offers is easy with Genie wallet. Book here now. YatraGenie is offering Bangalore site seeing at Just Rs 200 without using any offer code. Timings are 9 AM to 5 PM. Places under this site seeing package includes Iskon Temple, Bull Temple, Dodda Ganesh temple, Tippu Sulthan Summer Palace, LAL-BAGH Botanical Garden, Cauvery Emporium, VITC Science Museum, Cubbon Park, Vidhan Soudha. All entrance fees and guide charges are extra. Plan for a holiday trip and book here now. Booking Bangalore to Tirupathi transport tickets should be possible through yatragenie. Yatragenie is offering best fare on bus tickets for this route. Buses are available from 6:00 pm to 10:45 pm. Choose from different travels like Komitla, Srikrishne, Rajesh travels etc and get best discounts. Book now. Verified on 23/4/2019 .. YatraGenie is offering best bus booking fares on Bangalore to Hyderabad route. The minimum fare on this route starts from Rs 550 and maximum fare is Rs 2250 on this route. You can choose according your budget. Komitla Travels, Simhapuri Travels and Rajesh Travels are the leading operators in this route. Click here to discover the amenities offered by various operators. Book now. Yatragenie brings best service experience to its Gudur users. Here the cab fare is as low as possible. Yatragenie contact number in Gudur is 0861-2020202. Book using Yatragenie for your bus and cab requirements. Book using HappySale offers and save on your online bus and cab services. Now Yatragenie cab offers its services in Tirupati as well. Book here at its possible lowest fare and get best service from Yatragenie cabs. No offer code is required to get this. It charges Rs 100 for first 6 kms. All Pilgrims can utilize this offer. Enjoy booking bus tickets for these routes with more buses and make big savings without applying any offer code. Get hassle free bus bookings from Bangalore to Hyderabad can be done through yatragenie. Book here to enjoy special discount on your online bus bookings. Book now with HappySale Yatragenie discount offers and save your money. No discount coupons required. Happy saving! Book and get flat 12% cashback on all bus tickets online at YatraGenie. Apply coupon code on your bookings and make avail of this offer. Applicable for all users. Limited offer. Hurry up and avail now! YatraGenie Offers Flat 15% OFF on One Way Trip Bus Ticket Bookings in Komitla, Rajesh, Diwakar, Kamakshi, Mhalasa Travels, Morning Star,etc,. No offer is required to get this 15% discount. Book Your Tickets Now. Verified on 23/4/2019 .. Yatragenie is giving flat 12% cashback on Bangalore to Rajahmundry bus bookings. Choose buses from Komitla and Rajesh travels for this route and use this Yatragenie discount code 2017 while booking to get this cashback. Book with HappySale Yatragenie discount coupons to save on your online bus ticket booking. Book now. Refer a friend to download the app, Rs 100 will be added to your genie wallet within 48 hours of successful downloading and registration through yatragenie mobile app. Maximum referral credit one can gain using this offer is Rs 2000. Click here for more insights with respect to Yatragenie referral program and get the benefit of referral discount. Refer now. With Yatragenie, get Hyderabad to Chennai bus booking at discounted fare. Apply this voucher code to book bus tickets online in this route and get 12% cashback. This Yatragenie coupon code can be applicable only on Komitla and Rajesh travel buses only. Book here and save more on your Yatragenie online bus bookings. Book now. Now hotel bookings are available with Yatragenie. Book hotels in Vizag and get reduced booking charges. Here the room rent starts from Rs 750. Choose from the budget hotels and luxurious hotels as well, as per your budget and requirement. Welcome Grandbay, The Gateway Hotel, Fortune Inn Sree Kanya, Quality Inn Bez Krishnaa, Dolphin hotels, Green Park, Micro Continental are the leading Hotels in Vishakhapatnam. Choose from these hotels based on amenities provided by them. Book today. Book Bangalore to Vijayawada bus tickets online at Yatragenie. Book here and get 12% cashback by applying this Yatragenie coupon code while checking out. This discount coupon code is applicable on Komitla and Rajesh travels only. Minimum booking value must be Rs 600. Book here and get the discount along with the amenities provided by the operators. Yatragenie is an online travel portal that gives world-class travel experience to the populace of India. It is your go-to source for bus booking, cab booking and hotel booking services. And, will soon extend services to airlines and logistics administration. It will be a one-stop destination for bus and cab bookings pan-India soon. With Yatragenie, you can book bus tickets online to any of the southern states and cities easily. Popular bus route network includes Hyderabad, Bangalore, Nellore, Vijayawada, Guntur, Ongole, Eluru, Rajahmundry, Vishakapatnam, Kakinada etc. And, popular operators include SRS, Komitla, Morning Star and Orange Travels. Apart from this, it is soon going to offer the best tour packages to its customers. This online travel portal offers bus booking, radio taxi and hotel booking services at the best and affordable rates. Apart from this, you can also get up to 10% cash back when you pay via Paytm Wallet. You can also book your tickets from the palms of your hands -using Yatragenie app. And, you can make the payment via Genie wallet. It is well known for its best services, affordable pricing and special security for lady travelers. Yatragenie gives out various offers and deals on bus tickets, cabs, hotels and tours to its customers every now and then. If you are planning to save more on your travel and hotel bookings you can use the coupons present on this page. We at Happy Sale, keep updating the latest yatragenie promo codes to help you save your money. Stay tuned to this space for exclusive offers on Ticketgoose as well!